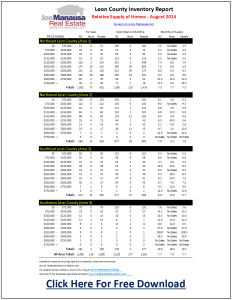 We posted our monthly report on supply and demand for homes in Tallahassee yesterday. The good news is that we saw the seasonal reduction in the available supply, and home sales did improve slightly in July when compared to July 2013. 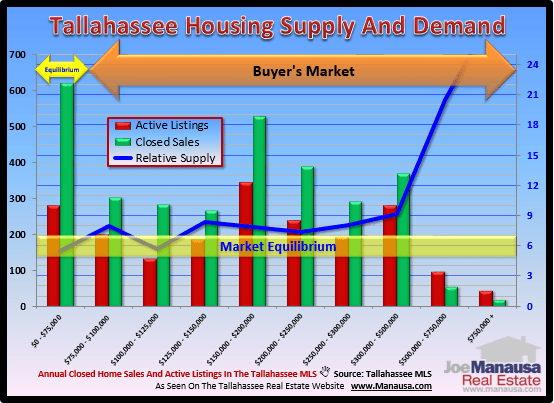 But there still are far too many homes for sale in Tallahassee, and we need to see the demand side of the market begin to return to normal levels. The following real estate graph shows the number of active listings of homes by price range (red bars) and the number of home sales over the past year (green bars), both measured on the left vertical axis. The relative supply of homes is shown as a blue line and measured as months of supply on the right vertical axis. The yellow band in the graph represents a level where the market is considered in equilibrium, or balanced between supply and demand. Whenever we see the blue line go above the yellow band, we say that it is a buyer's market, while below the yellow band represents a seller's market. Currently, only the very lowest segment of our market is in balance, while all others continue in a buyer's market. The reason that we publish supply and demand reports on a regular basis is so that our readers know how to negotiate their sale or purchase. For example, if you are looking to buy a home for roughly $110,000, you should expect to have a lot of competition (other buyers wanting the same home). The market is balanced and the best deals leave the market rapidly. But if you are looking to sell a home that is priced above $500,000, you need to know that there are many other people in the same boat, and very few buyers in the market right now. You will need to be priced as the best deal in your neighborhood/area, and you should be prepared to find limited showings if you are not priced aggressively. Regardless of whether you are buying or selling, you will have an advantage knowing the depth of the competition at your price point. If you would like expert assistance in the Tallahassee housing market, just drop me a note and we can schedule a time to help you prepare for your real estate transaction.